U.S. Ambassador to Nigeria, Stuart Symington, visits Osun State ahead of the September 22 governorship polls. The United States government has called for a peaceful and honest process in the September 22 governorship election in Osun State. U.S. 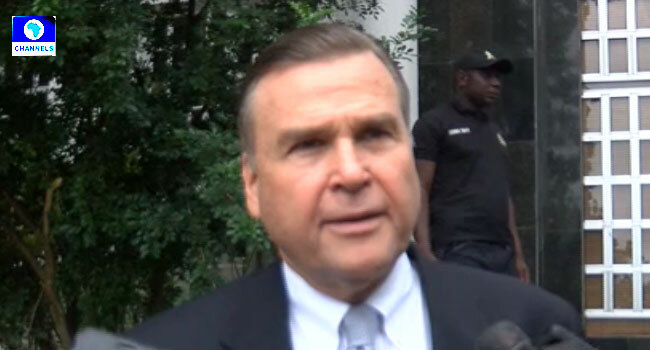 Ambassador to Nigeria, Mr Stuart Symington, made the call in Osogbo, the state capital on Friday. “On elections coming up, that election should absolutely be peaceful, fair and honest and should reflect what all of you believe,” the U.S. envoy said when he visited the candidate of the Peoples Democratic Party (PDP), Senator Ademola Adeleke, and that of the All Progressives Congress (APC), Mr Adegboyega Oyetola. According to him, the electorate can only support partners in ensuring that things work out fine during and after elections are conducted. Symington stressed that the U.S. government does not have a candidate in the governorship election or subsequent polls but was interested in a smooth electoral process. “Our only hope is that together, you will make a difference that will last for the future of all your daughters and sons. Nigeria matters and anything good that will be done in Nigeria will be done by Nigerians and not by others. “Only partners can help but only Nigerians can make a difference that will last,” he added. With the election coming three weeks from now, the US envoy is optimistic that residents of the state will avail themselves of the opportunity by choosing who will govern them for another four years.